Simon stopped the car in the middle of a rural road in Lower Silesia, Poland. His wife, Beata, ran out to nearby garden and returned with a handful of wild pink roses. “That’s what my childhood smells like to me,” she told her husband as she held open her hands full of crushed rose petals. Those rose petals would be made into a classic Polish preserve of rose petal jam. Earlier this week, I had a special opportunity to meet Beata Zatorska, a former Polish native, and her British husband, Simon Target, the authors of Rose Petal Jam: Recipes and Stories of a Summer in Poland and Sugared Orange: Recipes and Stories of a Winter in Poland. A third cookbook focusing on Spring in Poland is in the works too. The couple was visiting Warsaw and held a book signing in connection with my local expat women’s group, International Women’s Group of Warsaw, at the Wilanow Wedel Café. I, of course, signed up immediately since I love cookbooks and am trying to learn as much as I can about Polish cooking while we live here. Polish cookbook author, Beata Zatorska, signing copies of her latest book in Warsaw on December 16. Zatorska wrote the two seasonal cookbooks based on her childhood memories of her grandmother and other family members in Poland as well as their own recipes. When she was 19 years old, she emigrated to Australia where she later became a family doctor and met her husband, Target. He has written and directed award-winning television documentaries and directed numerous television food shows with Australian chefs. More than 20 years later, Zatorska returned to Poland with her husband for the first time so she could finish her cookbooks and her husband could take the impressive photographs. The front cover of the latest cookbook - Sugared Orange: Recipes & Stories from a Winter in Poland. Rose Petal Jam: Recipes & Stories from a Summer in Poland also has been translated in German. As I look through the cookbooks, I can’t help but be transported to Zatorska’s Poland – a childhood surrounded by loving family members and an abundance of homecooked foods based on the Polish countryside. The cookbooks, part memoir and travelogue, bring to life the food, her memories, the traditions and the seasons. Summer produce in Poland, as shown by Target during his slideshow presentation. The best part was being able to Zatorska and Target in person! I immediately saw how much Zatorska still loved her homeland and how her husband had fallen in love with it as well while they traveled around the countryside and returned to cities like Warsaw and Krakow. The cookbooks are lovingly put together with some beautiful photos. Beata Zatorska, a former Polish native, and her British husband, Simon Target. Authors of two cookbooks featuring Polish cuisine. I’ve already starting bookmarking the recipes that I would like to make such as makowiec (a traditional, sweet poppy seed roll), apple pancakes, Lidia’s roast chicken and wild mushroom dumplings. I bet you won’t be able to resist these recipes either! If you have any interest in Polish cooking and the stories behind the food, then you’ll love these cookbooks as much as I am! I waited my turn so I could get both of my cookbooks signed by Zatorska. Makowiec sounds like what we fondly refer to as poppyseed roll (makos beigli; we're Hungarian Canadian). This seems to be a favorite holiday pastry in most eastern european countries. My great grandmother, grandmother and mother have kept up this delicious tradition in western Canada for the last 80 years or so...I think its time for me to take it on so that our family can keep the tradition alive. In Hungary, using the same pastry but different filling, there is also dios beigli or walnut roll. I like that even better than poppyseed! On another note...my mother is constantly on a quest to prevent her poppyseed filling from bursting out the side of the roll during baking. She's tried many tweaks in rising time, amount of liquid in the filling, pastry recipe...etc., etc. If you have any pointers she'd be ecstatic to make the "perfect" poppyseed roll this christmas! 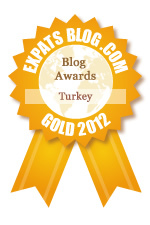 As always I love reading your blog...its so interesting to follow you through your food, travels and expat adventures. In Rose Petal Jam, Beata lists her poppy seed filling with the poppy seeds cooked in milk, almonds, walnuts and lemon zest. I've also read about adding candied orange zest too. The dough is a a basic yeast dough, but she describes it more like a cake. After you roll up the cake, you paint the whole roll with a whisked egg. Then, wrap a sheet of baking paper around the roll to stop it from expanding in the oven. Bake for 45 minutes. Hope this advice helps! If I get Makowiec made before Christmas, I'll try and share the full recipe and my tips! Cheers from Poland! And Merry Christmas to you and your family in Canada! Thanks for the tip...I don't think we've ever tried wrapping the poppyseed roll in parchment! I have never made Dobos torte personally...but my mom has a few times. And its delightful!